Jeep is honoring Veterans Day with a new special edition version of its 2013 Patriot. Appropriately enough, the Freedom Edition comes in only red, white or blue, and boasts a star graphic on the hood and rear quarter panels. Unique 17-inch wheels help set the model apart from other Latitude trim models, and inside, buyers can expect to find seats embroidered with the same star logo. A sunroof, security and cargo option groups as well as all-season floor mats are all standard equipment on top of the goodies included in Latitude trim. 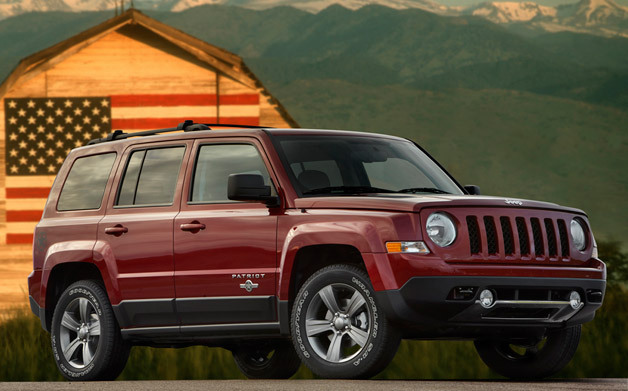 The 2013 Jeep Patriot Freedom edition hits dealers with an MSRP of $21,445. Chrysler says the Freedom Edition “honors military members past and present,” and as such, the automaker will donate $250 for each Patriot Freedom Edition sold to military charities. As you may recall, this isn’t the first Freedom Edition to bow under the Jeep banner. The automaker debuted the Wrangler Freedom Edition this year just in time for the Fourth of July. You can check the full press release below for more information. 2013 Jeep Patriot Freedom Edition a rolling tribute to America’s military originally appeared on Autoblog on Mon, 12 Nov 2012 14:00:00 EST. Please see our terms for use of feeds. A recall has been issued by the National Highway Traffic Safety Administration for select model year Jeep Grand Cherokee models and Liberty vehicles over airbag concerns. 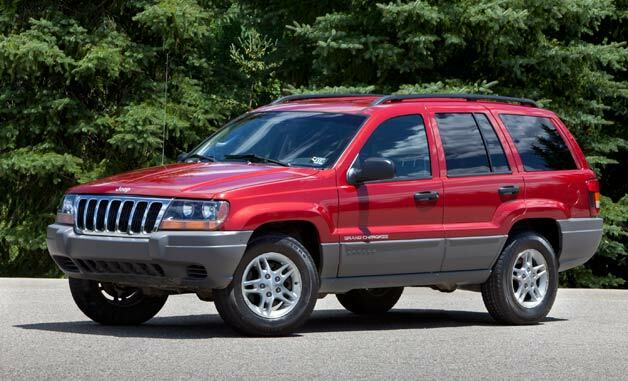 The recall extends to 2002-2004 Grand Cherokee and 2002-2003 Liberty models, affecting nearly a million vehicles worldwide. The central recall issue is a faulty sensor in the airbag control module that may result in the inadvertent deployment of front or side curtain airbags while vehicle is in motion. This obviously has the potential to be quite dangerous. Specifically, Liberty vehicles built between January 9, 2001, and March 28, 2003 are in question. As for the Grand Cherokee, potentially affected vehicles were built between February 13, 2001 and May 23, 2003. The number of recalled Jeep vehicles in the US totals 744,822, though when factoring global sales, that number swells to over 919,000. Chrysler plans on notifying owners beginning in January. The repair program will involve installing a supplemental jumper harness to the airbag control module at no cost to the owner. Jeep recalling nearly 1M Grand Cherokee and Liberty SUVs over airbag fault originally appeared on Autoblog on Fri, 09 Nov 2012 13:30:00 EST. Please see our terms for use of feeds. The Jeep Wrangler is already one of the best off-road vehicles on the market, but Thaler Design will help turn your Wrangler Unlimited into the ultimate off-road RV with its ActionCamper kit. The Austrian company adds a fiberglass camper shell featuring a pop-up soft top with enough space for a two-person weekend adventure. 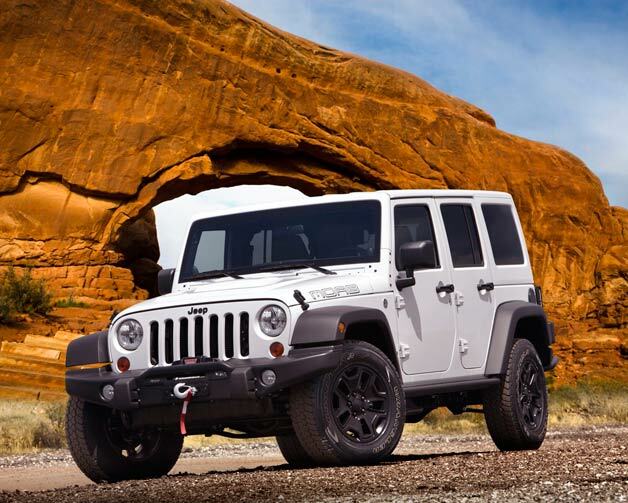 Even better, the top is removable (with very heavy lifting required) and it only adds a net 440 pounds to the Wrangler’s curb weight after components such as the factory top, rear doors, rear seat and roll bars are all removed. With the styling of an old military ambulance, the ActionCamper is about everything you need for a short off-road excursion, including a plenty of storage space, a refrigerator, stove, toilet and sink. The camper comes with a four-gallon fresh-water tank as well as a black-water (sewage/drainage) tank that can hold 5.5 gallons. The extendable nozzle from the sink can also be used as a shower. There’s also a fold-out king-size bed and, with the top popped, you get enough room in the kitchen/sitting area for a six-foot, three-inch person to stand up. GizMag says the ActionCamper has a retail price of $53,500, not including the donor Jeep. That’s serious money but it’s still cheaper than the survivalists’ special Earthroamer XV-JP. 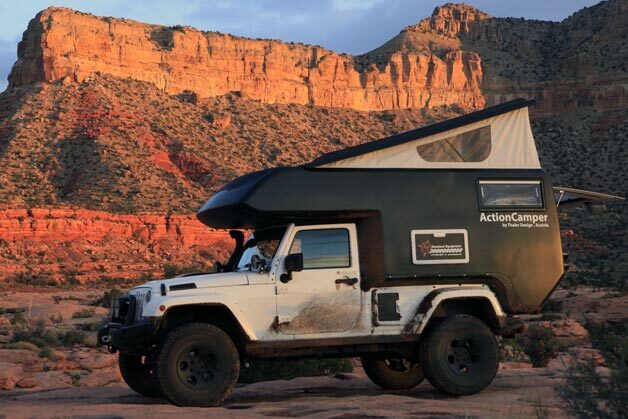 ActionCamper turns your four-door Jeep Wrangler into an off-road RV for two originally appeared on Autoblog on Sat, 03 Nov 2012 20:01:00 EST. Please see our terms for use of feeds. 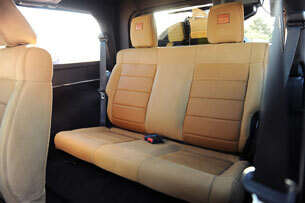 Quality Metalcraft’s CEO Michael Chetcuti has got big plans for the Jeep Wrangler – big enough to seat six, in fact. This QMC Jeep dubbed the JK Six Pak, for obvious reasons, is here at SEMA as a sort of proof of concept project. QMC has married the front portion of a JK Jeep Wrangler Unlimited four-door with the back half of the two-door vehicle, using a minimum of fabrication work to keep things clean and simple. The Six Pak rides on a custom lengthened chassis that was designed by Jeep aftermarket stalwart American Expedition Vehicles. In fact, AEV parts were used fairly extensively in this project: the front and rear bumpers, heat-extractor hood and roof rack all wear its stamp. Other than the 4.5-inch lift kit and external AEV add-ons, the Six Pak actually looks remarkably like something that could have come from Jeep’s own headquarters. The interior of the thing is well finished and seems awfully well screwed together for a one-off project that didn’t roll out of an OEM workshop, which is, after all, kind of the point. Chetcuti and QMC don’t have any concrete plans to go forward with series production of the Six Pak… for now. The CEO did tell us that response to the concept has been overwhelmingly positive from SEMA show-goers so far, and that his dream scenario would be a tie-up with Jeep that would allow for reasonable access to the parts needed to build the six-seater on a grander scale. You can show your support for the Six Pak, or just keep track of its progress, via its Facebook page, and/or by giving your opinions in comments below. Jeep JK Six Pak Concept is the three-row family off-roader you’ve been hankering for originally appeared on Autoblog on Thu, 01 Nov 2012 13:57:00 EST. Please see our terms for use of feeds. The XJ Jeep Cherokee is a remarkably capable off-roader. With good approach and departure angles, decent suspension flex from the factory and stout running gear, it will get you where you need to go within reason. Unfortunately for some would-be immigrants, even that talented machine doesn’t have the break-over angle necessary to drive over the border fence between the US and Mexico. Border Patrol agents came across this scene recently while on patrol, wherein a few innovative minds came up with a set of ramps to carry their XJ up and over the 14-foot-tall fence. The Boarder Patrol has since seized the XJ, which means it will likely languish on a government lot until it goes to auction. While we imagine the vehicle’s occupants simply set out on foot after the high-center incident, next time they might have a bit more luck with a Wrangler. You can check out a video of the SUV on the fence below. Jeep Cherokee left teetering on border fence after failed crossing attempt [w/video] originally appeared on Autoblog on Thu, 01 Nov 2012 14:41:00 EST. Please see our terms for use of feeds. There’s no doubt that the Jeep Wrangler is a shining beacon of aftermarket success here at the 2012 SEMA Show. If there’s any one vehicle that can stake a claim to challenging the Scion FR-S and Ford Mustang in the sheer-number-of-vehicles contest, it’s Jeep’s iconic off-roader. So it comes as little surprise that Mopar is interested in picking up a bit more of that market with its own factory-approved line of performance parts. In an effort to showcase what it offers in its catalog – “a portfolio of high-end, hard-core Jeep parts including axles, lift kits, bumpers, winches, skid plates and suspension components,” says the company – Jeep has unveiled the Wrangler Sand Trooper that you see above. Included in the upgrade list is a 5.7-liter Hemi engine conversion, portal axles, eight-lug beadlock wheels and a full underbody skidplate. Body bits consisting of half doors, a vented hood, flat fenders, a massive front bumper fitted with a Warn winch and a suite of LED lighting bits and a smattering of black trim round out the look. See all these bits and pieces in our high-res gallery above and check out the official press release below. Mopar launches Jeep Performance Parts with Wrangler Sand Trooper originally appeared on Autoblog on Thu, 01 Nov 2012 16:01:00 EST. Please see our terms for use of feeds. After wrapping up the first day of the 2012 SEMA Show, organizers handed out awards for some of the trendiest vehicles on display. Since the whole point of SEMA is to show off new products available in the aftermarket world for use in cars, trucks and SUVs, each year, the show distinguishes the most popular vehicle in various segments. Not surprisingly, this year’s Hottest Car and Hottest Sport Compact are the Ford Mustang and Scion FR-S, respectively, while the Ford F-Series brought home the Hottest Truck and the Jeep Wrangler was named the Hottest 4×4-SUV. More than 2,000 companies are at this year’s show, and the display booths represents a “vote” for each car to determing the trendiest vehicles in each of the four categories. It isn’t clear if these awards also take cars brought by OEMs into account, but the Mustang and FR-S were definitely well represented by both OEM and aftermarket show versions. As usual, the OEMs showed up in force at the this year’s SEMA Show exhibiting a variety of cars ranging from production-intent cars like the beastly Ford Mustang Cobra Jet to much flashier rides like Scion’s Carbon Stealth FR-S.
We’ve obsessively covered Day One of the show already, but stay tuned for our continued live coverage. 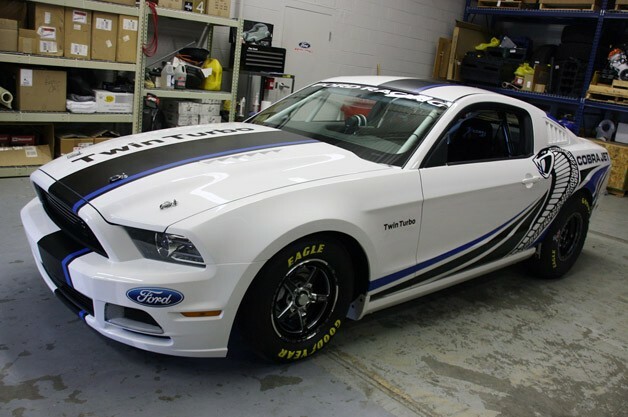 SEMA crowns Mustang, FR-S as this year’s hottest cars in the building originally appeared on Autoblog on Wed, 31 Oct 2012 17:40:00 EST. Please see our terms for use of feeds. Jeep to build all model lines in China? We’re quite used to seeing Jeep knockoffs come out of Asia (e.g. SsangYong Korando generations one through three), but if a new report is to be believed, we may start seeing the fair dinkum being built in Asia once again, too. According to Bloomberg, Chrysler parent Fiat is in serious negotiations with its Chinese joint venture partner, Guangzhou Automobile Group, over plans to build Jeeps locally. Of course, the brand previously built models in China before Fiat came into its management picture, but now there’s talk of possibly assembling more than one model – and possibly the entire brand portfolio – in China. The additional capacity would likely only augment Jeep’s US output, not replace it. Jeep currently builds all of its models in the US, but it has been enjoying rapidly growing overseas sales and is looking to capitalize on its momentum. Bloomberg notes that the marque is targeting sales of 500,000 overseas units, which would represent a three-fold increase over its 2009 numbers. In fact, more than three out of four overseas deliveries for Chrysler brands this year have carried a seven-slot grille. Demand for the Grand Cherokee and Compass models in China are said to be particularly strong. Jeep to build all model lines in China? originally appeared on Autoblog on Mon, 22 Oct 2012 16:29:00 EST. Please see our terms for use of feeds. After receiving a dozen complaints about stalling Jeep Patriots, the National Highway Traffic Safety Administration has decided to launch a formal investigation. The probe will look at about 112,000 Patriots from the 2011 and 2012 model years. NHTSA says some owners report their vehicles’ engines are completely shutting off at speeds above 65 mph. In at least eight cases, the drivers could not restart the vehicle, and in at least one incident, the stall involved a crash that injured two people. If the investigation turns up enough cases, the agency will issue a recall of the vehicles. A Jeep spokesman said the company is looking into the issue. 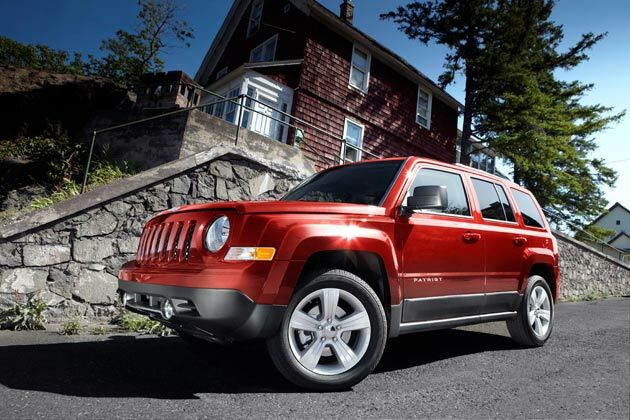 NHTSA to probe 2011-2012 Jeep Patriot over stalling fears originally appeared on Autoblog on Mon, 22 Oct 2012 18:00:00 EST. Please see our terms for use of feeds. Though it has been the company’s star-laden Super Bowl commercials starring Eminem and Clint Eastwood that have garnered the most buzz for Chrysler and its ad agency Wieden + Kennedy, the principals agree that it was a far earlier spot that has made the biggest impact thus far. 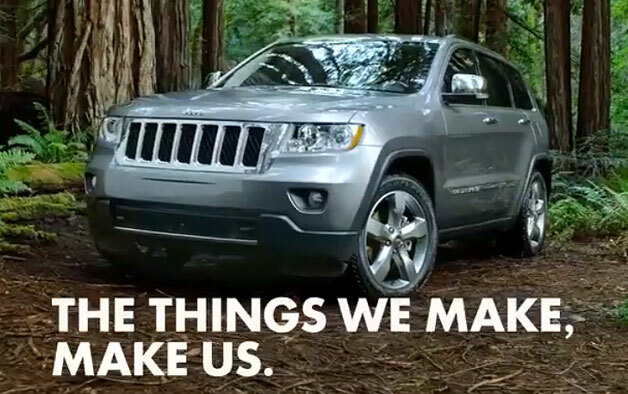 Chrysler CEO Sergio Marchionne and John Jay, Global Executive Creative Director for Wieden + Kennedy, agreed recently that it was the commercial for the 2011 Jeep Grand Cherokee that has had the most significant impact for Chrysler in the post-bailout era. The Grand Cherokee, you’ll remember, was the first product introduced by the Chrysler Group coming out of bankruptcy, and was therefore poised to make a big impression – good or bad – on the American public. The Jeep commercial then needed to hammer home the notion of a quality, American-made product, while also laying the groundwork for the Imported from Detroit commercials (of Super Bowl fame) that were still to come. Marchionne called the Jeep commercial “a turning point” and said that it was still being tweaked, right down to the very end. Watching the spot today (scroll down to have a look), it is easier to see it as a successful foundational piece of the messaging that we’re getting from Chrysler today. Sorry Clint and Eminem, your ads were not the most significant for Chrysler [w/video] originally appeared on Autoblog on Tue, 16 Oct 2012 15:45:00 EST. Please see our terms for use of feeds.